Liberally grease a 9-inch square casserole dish or 2 quart soufflé dish. Set aside. Over medium heat, rest the pasilla chiles on the grate of a gas stove, rotating the chiles every 30 seconds or so. Quickly transfer the chiles to a ziplock bag (or alternatively to a bowl and covering it with plastic wrap) and allow the chiles to steam, about 2-3 minutes. Remove them from the bag and using the blade of a knife, scrape the outside, charred skin off of the chiles. Dice the chiles, discarding the seeds, and set aside. Repeat this process with the corn, rotating the ears of corn every 30 seconds or so. Cut the kernels off the cob and reserve 1/2 cup for later use. Transfer the remaining 1 cup of corn kernels to the jar of a blender. Add 2 cups of milk and salt; blend until completely smooth, about 1 minute. Transfer to a medium pot and heat over medium-low heat. In a measuring cup, measure out the remaining 3/4 cup milk and mix in the cornmeal. Add the cornmeal/milk mixture and cook until the grits have thickened, about 4-5 minutes, stirring frequently. Take the grits off of the stove and stir in the diced chiles, reserved corn kernels and cheddar. Stir until thoroughly combined. Do a taste test and adjust the salt accordingly. Transfer the mixture to a large bowl and cool until room temperature. Preheat the oven to 375 degrees F. In a medium bowl, beat the egg whites with the cream of tartar until stiff peaks form. Add the egg yolks to the cooled grits until completely combined. In three batches, fold in the stiff egg whites. 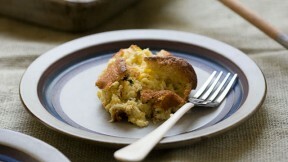 Pour the batter into the prepared baking dish and bake until the spoon bread is golden brown, about 45-50 minutes. Serve right away.